Essential Drugs Company Limited (EDCL) is a 100% state-owned Pharmaceuticals Company in Bangladesh. In the year 1962 it was functioning under the then Central Government in the name & style of Government Pharmaceuticals Laboratory (GPL) and subsequently it was renamed as Pharmaceuticals Production Unit (PPU) in the year 1979. In the interest of Public Health & smooth running of the organization, it was registered as a Public Limited Company under the Company’s Act-1994. The Ministry of Health & Family Welfare of Bangladesh is its controlling authority. It was established in 1983 with the main objective of setting up an advanced pharmaceuticals industry in the Country for the local production of medicines and to supply these products inside the Country for public health and for Export. Essential Drugs Company Limited Job Circular 2019 has been published by the authority. Essential Drugs Company Limited is one of the most important company. Essential Drugs Company Limited published an attractive job circular. Anyone can take this opportunity. 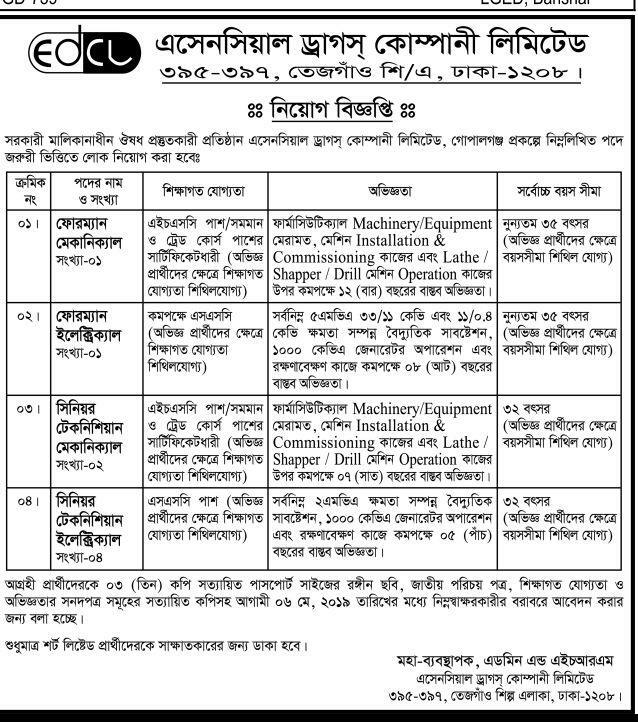 This job circular is too much important for the unemployed people. I am scearching mid level job.